Mechanised warfare and the increased firepower of the armies in 1914-18 resulted in an unprecedentedly high proportion of men wounded in action – around two million in the British Army. Those who were injured in battle were treated in a well-orchestrated evacuation system that saw them transported from the front line for treatment via a variety of transportation in an ordeal that could be painful and often so prolonged as to be life threatening. The regimental aid post, situated in or just behind the front line, was where men received initial treatment; the badly wounded were brought in by stretcher-bearers and medical officers who bravely went out under fire to drag in men, or administer treatment where they lay. Transferred to an ambulance (a motorised one afforded more comfort than horse-drawn), or sometimes a motorcycle with ambulance “sidecar”, they would be taken to an advanced dressing station to receive emergency treatment before moving on to a casualty clearing station – a field hospital consisting of tents, Nissen huts or specially commandeered buildings. After assessment here, the journey to a base hospital was usually by hospital train under the care of medical officers and a team of nurses. This often took several hours and, with frequent stops, it could be a long and tedious journey for those in severe pain. Base hospitals were safely located some distance from the fighting fronts, often in re-purposed buildings such as hotels, or even casinos where the palatial rooms were well suited to transformation into wards. 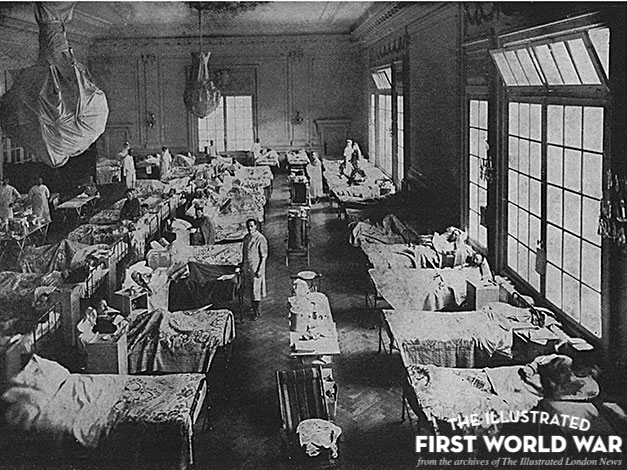 Those who needed further treatment, and were fit enough to travel, sailed by hospital ship back to Britain to be cared at one of the hundreds of military hospitals and convalescent homes that had sprung up around the country in converted municipal buildings or donated mansions and stately homes. The ILN magazines took a detailed interest in the various stages of medical care and recovery from the work of the R.A.M.C. in the field to the novelty of seeing the magnificent rooms at Cliveden and Blenheim filled with hospital beds and populated by convalescents in their familiar blue uniforms. The rehabilitation of men undertaken at institutions such as Queen Mary’s Hospital in Roehampton, known as “The Human Repair Factory”, which fitted amputees with prosthetic limbs, or St. Dunstan’s Hostel for Blinded Soldiers and Sailors in Regent’s Park, was also well documented.